How long has it been since you looked at some of your oldest research? A year or two? Several years? You might be surprised and in for a treat if you pick up one of your loose ends. With the number of new databases added daily to the internet, the answer to a nagging question might be waiting. Need more convincing? Keep reading for three reasons to revisit your research. I recently revisited a Confederate soldier in my family: C.B. (Charles Baldwin) Royston. He enlisted in the Confederacy but never came home from the Civil War. I researched the Royston family in 2004 and located references to his military service, but couldn’t find his death information. I’ll use C.B.’s story to illustrate the three reasons below. I happened upon C.B’s Compiled Military Service Records (CMSR) in a serendipitous moment. Because Royston is a somewhat unusual surname, I often use it when experimenting with new databases. 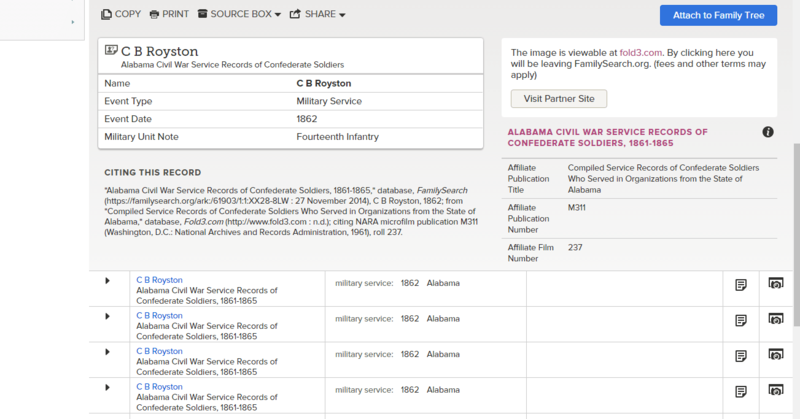 I was adding links to my Alabama State research guide and added the FamilySearch collection “Alabama Civil War Service Records of Confederate Soldiers, 1861-1865.” Then I typed in “Royston” to see what might come up. I had several hits for C.B. and when I clicked on one of them I saw an index card of the basic information and an invitation to view the image at fold3.com. At the time of my initial research, these records were only available at the National Archives for a fee and I didn’t pursue ordering them. 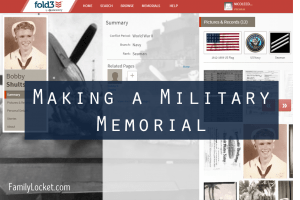 Fold3 in partnership with the National Archives has digitized and indexed the CMSR’s. I have access to this subscription website, but if you don’t, check with your local Family History Center or library. They may allow you to use it there. Fold3 also has a free trial period. Hospitalized at Lovingston Hospital, Winchester, Virginia for “debilitas” on 14 August 1862. Present on Company D’s Muster Rolls for 1862 and through June 1863. Noted as a deserter for the September and October Muster Rolls of Company D.
Captured at Chestnut Run on 15 October 1863 as a deserter. Imprisoned at Old Capitol Prison, Washington, D.C. on 18 October 1863. Admitted to the Kalorama (Eruptive Fever) U.S.A. Gen’l Hospital in Washington D.C. on 29 January 1864. Why did I care about C.B. Royston’s life details? I wanted to honor C.B’s memory and record his story. Without a spouse or children, if I didn’t do it, who would? C.B. was the older brother of my great grandfather, Robert C. Royston. Although I didn’t know what kind of relationship they enjoyed, I did know that Robert named his son after C.B., who also named his son C.B. Finding out about C.B. also helped me feel more connected to my great grandfather Robert and his family, although I never knew them. Putting the facts into a timeline gave me a broader picture of C.B’s military experience and left me with many questions. With the vast amount of information available on the internet I quickly found answers to my questions. What was Variola conf., his cause of death? Doing a quick Google search, I got a hit from Google Books. The Encyclopaedia Britannica: A Dictionary of Arts, Sciences and General Literature. Volume 22 described it as “confluent smallpox.” With extreme fever, the mortality rate was very high. Written in 1890, this information not only answered my question but put it in context of the time period. Typing an unusual phrase into the Google search box is a quick and effective way to decipher any unusual terms you find in your research. Old Capitol Prison, ca. 1860-1865, War Department, Office of the Chief Signal Officer, National Archives and Records Administration. The Old Brick Capitol in Washington, D.C. served as temporary Capitol of the United States from 1815 to 1819. The building was a private school, a boarding house, and, during the American Civil War, a prison known as the “Old Capitol Prison.” Razed in 1929, its site is now occupied by the U.S. Supreme Court building. Seeing a photo and learning about the prison gave meaning to the simple reference on C.B.’s compiled service record. Kalorama General Hospital opened in May 1861 and remained open beyond the end of the War. 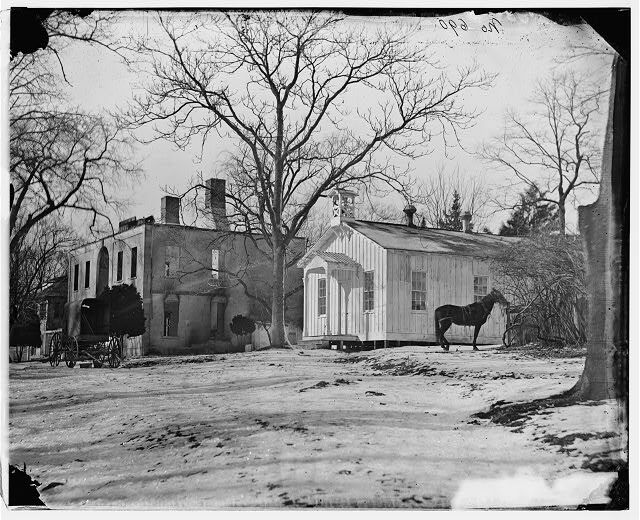 In August 1861, the hospital was moved to a brick house in Kalorama Heights. Additional pavilions were built in 1863 and 1864. A branch hospital was also erected for employees of the Quarter Master’s Department. Washington, D.C. Ruins of Kalorama Hospital, 23d and s Streets, NW, Library of Congress Prints and Photographs Division,Washington, D.C. (http://hdl.loc.gov/loc.pnp/pp.print). In just a few minutes, I had learned about C.B’s illness, the prison, and the hospital where he died. I could add these details to his story and could also research his company and regiment, battles, and the location he was taken prisoner. That information might be just as readily available on the internet. 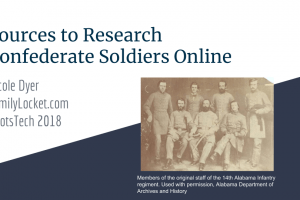 The FamilySearch Wiki not only described the CMSR’s, but also had information and links to many more websites about Confederate Service Records. If you haven’t used the Wiki to learn about record types, start now. 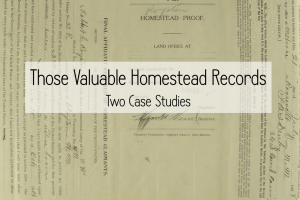 You will save time and effort by starting your research armed with knowledge of the records and where to access them. It’s a good feeling to wrap up the loose ends of C.B. Royston’s life. No longer will his record say only, “died in the Civil War.” Because of the availability of the CMSR’s and the wealth of information on the internet, I can write a much better story of his life. What new discovery can you make today? Take advantage of the vast amount of records, information, and education opportunities now available from your home. Dig out some old research and see what you can find.